An international traveler arrives after U.S. President Donald Trump's executive order travel ban at Logan Airport in Boston, Massachusetts, Jan. 30, 2017. The Trump administration has appealed a decision by a federal judge that blocked the government’s revised travel ban on people from six Muslim-majority countries. The U.S. Department of Justice said in a court filing Friday it would appeal a ruling by U.S. District Judge Theodore Chuang in the state of Maryland to the 4th U.S. Circuit Court of Appeals. 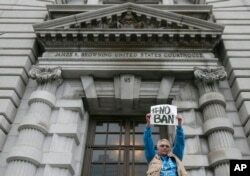 The move comes two days after the federal court in Maryland along with another in Hawaii struck down parts of Trump’s travel ban, both ruling that it discriminated against Muslims. 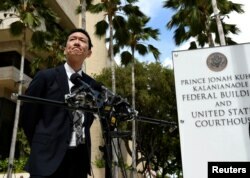 FILE - Hawaii Attorney General Douglas Chin answers questions from the media at the U.S. District Court Ninth Circuit after presenting his arguments after filing an amended lawsuit against President Donald Trump's new travel ban in Honolulu, Hawaii, March 15, 2017. Chuang issued an emergency halt to the portion of Trump’s executive order that temporarily bans the entry of travelers from six Muslim-majority nations. He left in place the part of the order that temporarily bans refugees to the United States. Another judge in Hawaii struck down both portions of Trump’s travel ban. Spicer said the administration would first appeal the ruling by the judge in Maryland and then seek clarification of Hawaii’s ruling before appealing that decision. An appeal of the Hawaii case would go the 9th U.S. Circuit Court of Appeals in San Francisco, the same court that upheld a decision to block Trump’s original travel ban, which was issued on January 27. The new executive order, which was supposed to go into effect early Thursday, was reissued with the intention of overcoming any legal concerns with the first travel ban. Trump has vowed to take the matter all the way to the Supreme Court, if necessary. The Trump administration said the travel order is necessary to protect the country from the threat of terrorism.It features a four-month ban on admitting any refugees and a three-month freeze on issuing visas to people from Iran, Syria, Yemen, Libya, Somalia and Sudan. An earlier version of the order included Iraq in the targeted countries, as well as a clause that exempted religious minorities from the ban. Trump has said the court’s ruling makes the United States look weak, and that he will continue the legal battle. 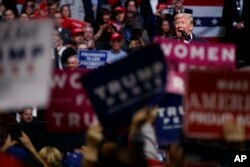 FILE - President Donald Trump addresses a rally in Nashville, Tennessee, March 15, 2017. Both of the judges that blocked Trump’s revised travel ban cited comments Trump made when he was a candidate for president and before he took office. Trump’s campaign once included a call to ban all Muslims from entering the United States, a policy that was later changed to advocating “extreme vetting” for people from countries with a link to terrorism. “This order doesn’t draw any religious distinction at all,” Wall added.